One of the more believable rumors making the rounds in the silly season is that Nico Rosberg might be moving to a new team in 2008. This is given weight by Frank Williams' recent praise of his driver. When a team owner compares his charge with Lewis Hamilton and admits that he would really shine in a better car, it sounds like the merchandise is being polished to increase its price. On his part, Nico has been very open about the difficulties of driving for a midfield team - and he is clever enough not to criticize his team without the go-ahead from his boss. It's Nico saying he's available and Frank saying the buyer will have to pay. It is a sad fact of life that teams on smaller budgets have to look at all possible ways of increasing their income. Far too often this means selling their most valuable asset: a good driver. And that begins a downward spiral that is very hard to arrest, as pay drivers are rarely good enough to demonstrate the full potential of a car. Then the driver carousel starts, with seats being sold to the highest bidder, development of the car lagging as it fails to get attention from a driver who knows his stuff, and everything slips away. Looking at Williams' present line-up, it would be absolutely ideal were the finances in better shape. To team a very fast young driver with an older and wiser colleague, who can still pick up the points when the other fails, is probably the best combination there is. 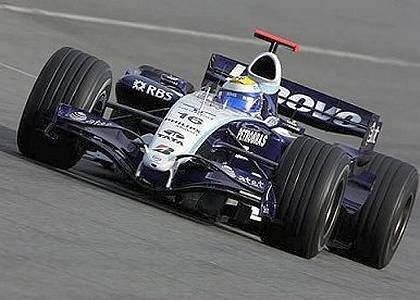 Everyone knows that Rosberg is quick and hardly needs hyping to interest buyers, while Alex Wurz is a good racer and excellent at assisting the engineers to develop the car. So it is unfortunate that Williams is having to consider selling Rosberg; it is hard to see where they are going to find as bright a talent for less money and their chances of championships diminish as a result. With Wurz's position also unsure, the chances are that the line-up for next year will be much less than ideal. All of which makes the team's prospects for the future seem fairly bleak. This is the team that were winning races and championships not long ago yet the realities of modern F1 are forcing them out of the game. It looks as though they are destined to fade away unless a partnership with a big player can be formed. That would be Toyota, of course, but neither party seems prepared to go down that road just yet. Perhaps another year of mediocre results will persuade them that they need each other. In the meantime, Rosberg will be off to another team and we wonder which. Renault could be an option, although that depends very much on how much truth there is in the rumors of Alonso's dissatisfaction at McLaren. BMW is unlikely since they would only break up their present team if Alonso became available (and, I think, not even then). So again the answer looks like being Toyota. Surely Ralf must go at the end of the year and be replaced with a younger driver with more fire in his veins. I cannot see Alonso being interested in driving for the great under-achievers of the grid, so Rosberg would be a perfect solution. And that brings Williams and Toyota together again; it is almost uncanny how these two teams seem made for each other. Maybe one day they will both get over their pride and see that their best bet is to merge the teams, with Toyota providing the financial muscle and Williams the racing expertise. And, in that case, Nico would get the car he so obviously deserves. That would be a deadly combo, the works Toyota's have been qualifying so high (relative to their success) and Williams seem so consistent this year. Surly running in the mid pack, with the money they have been spending, cannot be good from a PR standpoint for Toyota. Heres hoping they have some common sense! Those are the worst scenarios, but why are those even concerns? We should have had 24 cars minimum the entire time. I think that is why it's absolutely necessary to have customer teams, Dan. Only the manufacturers can afford to build the whole car and F1 needs small constructors and customer teams to make up the numbers. Williams will have to find a manufacturer to partner with or it will not be able to compete in the future. I think there are teams out there waiting to get in - Campos is one, a GP2 team that is thinking of moving up and is interested in buying into Super Aguri as a quick route in. Their original plan was to form a new team but the SA opportunity came up and they might take it. I hate to say it but I think that Nascar would give you a better return on your money. It obviously makes sense for big manufacturers to show their wares. Thats of course if you were in it for the money and not the racing..... Oh wait F1 doesn't have that either. I've often wondered why a European manufacturer doesn't have a go at NASCAR. It may be that the rules are designed to exclude them but I think most have comparable cars to the models the American manufacturers use as their base. That would introduce a little variety into the races (I can't tell the cars apart unless they have a big Ford, Dodge or Chevy badge on them - actually, I don't think the Americans care and that's why they just refer to car 42 or car 51 and so on). The returns are far better because the investment is so much less than in F1 The problem for Europeans would be the oval thing, I think. It takes time to learn the techniques involved and it's also incredibly dangerous. Not really to Euro tastes, perhaps. But yes, it would sell cars in the States.